As a general rule we don’t write about the events we host, but we had such a good time that we wanted to share it. The decision to tailgate happened months ago ironically at a Cleveland Indians game with Gina. I knew the rivalry between OUR Cleveland Browns and Chauna’s Steelers would be in full swing. This sealed the deal for our first tailgating event! What you are about to read is the perspective of our die hard Cleveland sports fan and that of a Steelers shirt wearing...I don’t know what to say, she’s a Steelers fan, I don’t get it. These are their stories. 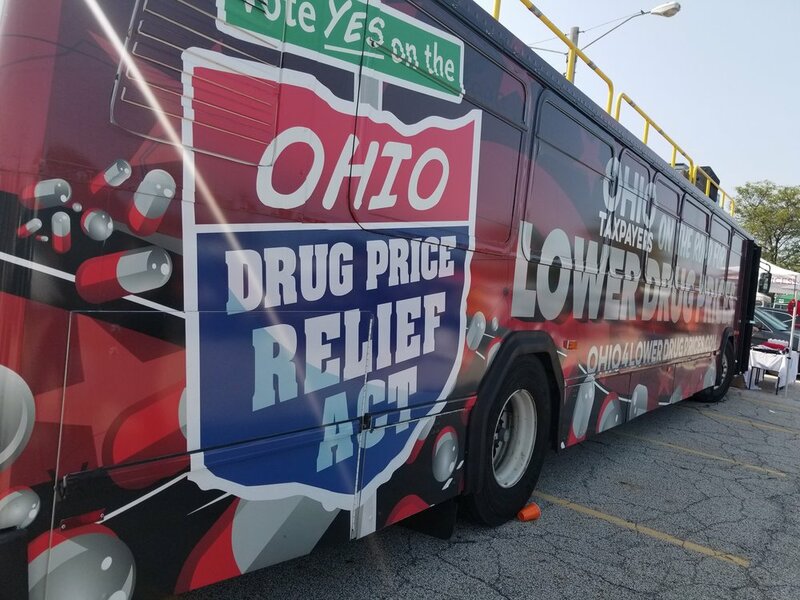 It’s the day after the Cleveland Browns home opener and I’m going to call it a VICTORY Sunday! Despite the Browns loss, I won’t say the Browns were defeated or the city of Cleveland. 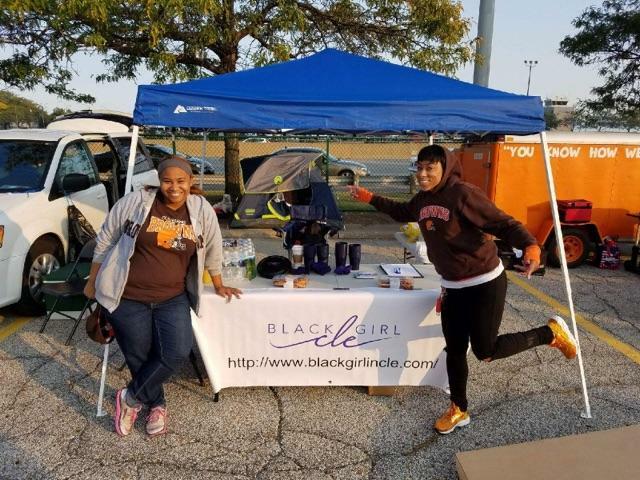 The Black Girl in the CLE squad took to the City of Cleveland Municipal Lot and rang in the first game in fanatic Dawg Pound fan fashion. I started the pregame journey early, like 3:00 am early, got myself ready, beat the traffic and arrived for the gates opening at 7:00 am. Surprisingly, I ended up being the sixth car to pull into Muni Lot and was anxious to select my spot to park. Once in the gate, I parked and immediately began setting up. 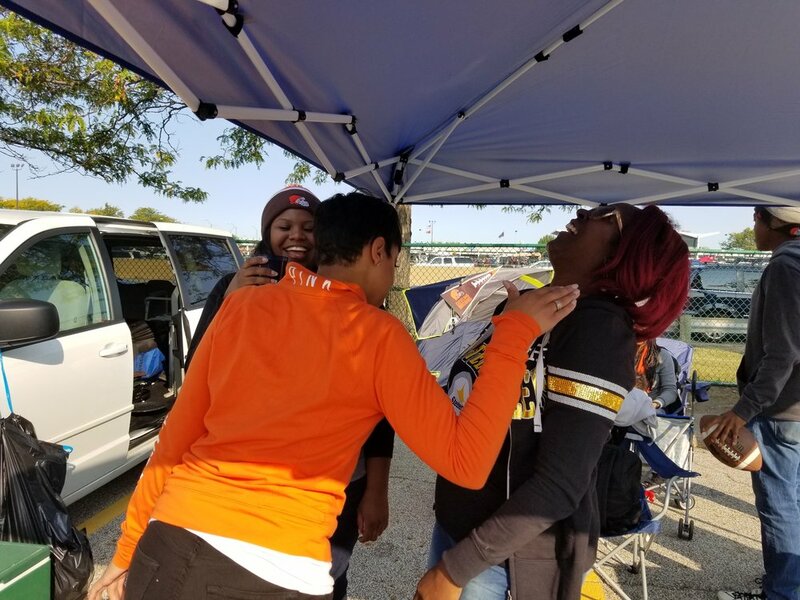 I could not help but notice that other tailgaters were quick to set up and greet fellow tailgaters beside them; sharing food, drinks, lighters, grills, smiles, and chants. It was like a community. The energy in the lot was electric and I experienced some of the best DJs in the city all in one setting. 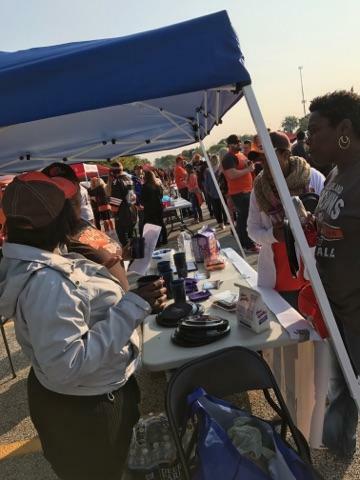 Throughout the day tailgaters stopped by the Black Girl in the CLE booth and I engaged with them by asking their thoughts about the game and sharing our group's purpose. I enjoyed playing corn hole, Jenga, and meeting new people. The Cleveland Browns played solid and did NOT get dominated on the field by the rival Pittsburgh Steelers. The players linked arms with police officers during the national anthem and on a beautifully clear 72-degree fall day in Cleveland, Ohio. It was a Victory SUNDAY! It was a sweet victory indeed for my Pittsburgh Steelers! The Brown played very well and which made this a fantastic rivalry game for the start of the season. 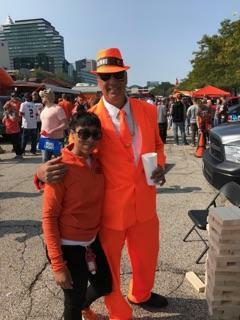 I have to say I was very impressed with my first tailgating experience at the Muni Lot especially since I'm a Steelers fan. It surpassed my expectations because I was a bit nervous, and for good reason. This is Brown’s Country. Now let me make this clear. Cleveland is truly the “The Land” that I love so you can imagine my apprehension of splitting my loyalty. But the one thing that I knew for sure was that anything goes when you're in Brown's Town and boy did the fans show up and show out! I can't count how many buses I saw that had speaker systems, TVs and more. People grilling, laughing, playing games, wearing decorative costumes, and of course having lots of beverages. Even though I was in the presence of my enemies, everyone was pretty chill and just there to have a good time. I had so much fun bumping fists with other Steeler fans and getting told that I was too cute to be wearing my Steelers gear. It truly was all love. After this experience, I can say that I love Cleveland even more. Thanks for showing us a great time. I can’t wait to do it again! 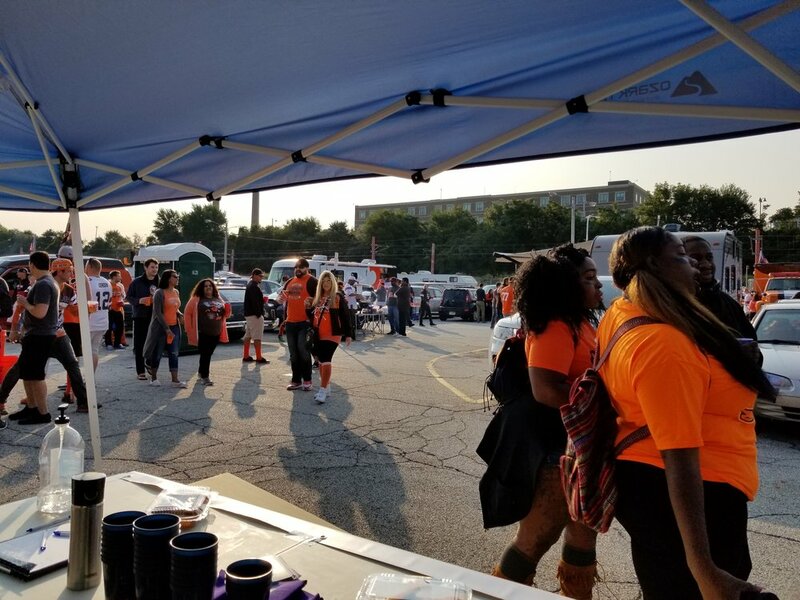 Stay tuned for another tailgate event in October and check out our photos below.